Planning an online chat, conference call or videoconference with participants in Iraq and around the globe can be difficult, especially when you need to find a time in the day when everyone is in their business hours! 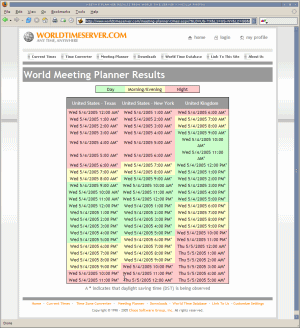 This world meeting planner allows you to choose the date for your meeting and the locations (including Iraq) of the people attending. Your world meeting planner results allow you to see the relationship each location has in regards to daytime hours with proper adjustments for any locations observing daylight saving time, so you can quickly target a time that works for everyone. Select up to eight locations (including Iraq) where participants for your meeting or conference call are located. Copyright © 1998 - 2015 WorldTimeServer.com All rights reserved. Executed in 0.016 seconds.